AxisPortals came of age during the moon frenzy. She read Tom Corbett books, drank bright orange Tang, begged her mother to purchase SpaceFood Sticks (the chocolate version was just barely edible, but the taste wasn’t really the point–it was the idea of the thing that mattered), and could, like most children of that era, do a perfect imitation of a NASA launch countdown. “Lift-off” soon became part of the everyday vocabulary of childhood. Even the family cookie jar bore witness to the urgency and romance of the space race. Over the weekend, the fifteen year old that AxisPortals knows best observed, in passing, that he found Facebook rather dull. Oh, he said, it had been fun for a little while, but with everyone (and their parents and grandparents) there–and with the endless invitations, applications, and updates–the initial appeal for him had faded considerably. On the whole, he noted, MySpace, despite its current lack of cool, had been a whole lot more fun. At least it could be readily tinkered with, and it wasn’t quite so parent heavy. Somewhere in there, he sighed over the boredom of it all. AxisPortals wonders what, if anything, in the technological realm today fills us with wonder and excitement? What makes us want to dance in the moonlight all over again? Countless gurus inform us of how we can and should use technology to improve our personal and professional lives, but it’s just as important to tend to what captures our imaginations, what fires us up, what gets us moony and starry-eyed, what makes us want to reach for something more. AxisPortals Aphorism: In the rush toward technology, don’t miss out on the romantic rush of dancing by light of the moon, or the sweet challenge of reaching for it. The beginnings of a summer soundtrack. . .
AxisPortals has been spending a good bit of time involved in extra-technological pursuits this summer: perched on metal bleachers absorbed in baseball’s eternal dance of swings, slides, stretches, signals, and silences; crouched in gardens planting flowers and pulling weeds; settled quietly outside on cool nights, head tilted toward the sky where lightning bugs blink high in the trees and bats scribble crazy black paths against the evening’s deepening blues. 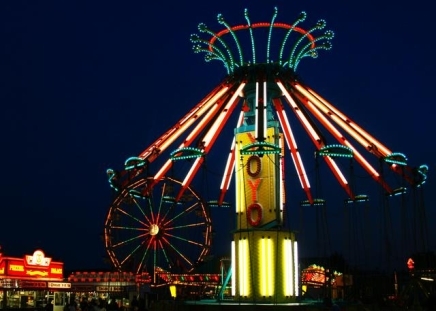 AxisPortals has been to the carnival, too–braving Pharoah’s Fury, the Tilt-A-Whirl, and the Sizzler, and reaching once more for youth’s elusive brass ring with a few spins on the carousel. She let cotton candy dissovle on her tongue, held her arm obediently still as a large but temporary tattoo of a tiger was applied, and gamely toted the assortment of toys won at various “give us three bucks and we’ll give your kid a cheap prize” booths. Oh, yes. AxisPortals has been technologically indolent, and has the fading sunburn and the collection of mosquito bites to prove it. Work must always be tended to, of course, but this little bit of backing away from the various keyboards and virtual connections that sometimes dominate our day-to-day lives seems important. Even though this bit of flowing with the rhythms of summer does only qualify as a small break–after all, AxisPortals did send several text messages from the carnival, and does tend to have the Blackberry clipped to her waist even while gardening–there’s nonetheless something peaceful and revitalizing about purposefully stepping away from tweets and blogs to dance to summer’s fleeting music. AxisPortals Aphorism: If you can’t remember what bug spray, sunscreen, or an approaching thunderstorm smell like, back slowly away from your tech, and step outside, into summer’s dance. AxisPortals Aphorism: Catch the Wave (if you get my drift). 1. Real Time. Google caught the Wave of that trend today BIG TIME. 2. Mobile. Google, again, caught that wave big time Wednesday when it handed Android phones to everyone at its IO conference. 3. Decentralized. Does Microsoft or Twitter demonstrate that trend? Not really well. 4. Pre-made blocks. I call this “copy-and-paste” programming. Google nailed it with its Web Elements (I’ll add a few of those next week). 5. Social. Oh, have you noticed how much more social the web is? The next two days I’m hanging out on an aircraft carrier with a few people who do social media for the Navy. 6. Smart. Wolfram Alpha opened a lot of people’s eyes to what is possible in new smart displays of information. 7. Hybrid infrastructure. At the Twitter Conference this week lots of people were talking about how they were using both traditional servers along with cloud-based approaches from Amazon and Rackspace to store, study, and process the sizeable datasets that are coming through Twitter, Facebook, and friendfeed. I’m not sure I’m yet a huge fan of Robert’s suggestion to replace version numbers with years (there are some drawbacks to any numbering system), but his point is well taken: because what we can do and how we can interact online is in a state of perpetual change and emergence, it makes much more sense to think in terms of what is current/contempary and what isn’t than it does to think in terms of version numbers that are inevitably overused, and that inevitably oversimplify all that they attempt to capture. AxisPortals Aphorism: The wave of the web constantly emerges. A flow can’t be pinned down with a number. Thanks to Robbin Zeff Warner for posting the “…A Different Kettle of Shoes” entry from her husband Gene’s Innocents Abroad blog to the Writing Program Administrators discussion list. Gene captures something essential about the nature of collaborative writing, there. What’s true of NATO’s collaborators is true–if on a somewhat smaller scale–of most all instances of writing by committee: in the push to honor every sensitivity, include every perspective, address every fear, and anticipate every possible political objection, we inevitably sacrifice clarity. For all its joys, collaboration always involves some risks. AxisPortals sometimes thinks the story of the The Blind Men and the Elephant should be meditated upon prior to any committee meeting that will result in a collaboratively written document. Most committees can’t quite claim NATO’s brand of international, multilingual diversity, but when various disciplines, departments, or brands of expertise are present, the result is the same. That’s one “kettle of shoes” in which lots of us have walked a kilometer or two. AxisPortals Aphorism: With a clear sense of purpose, an appreciation of the risks, and an excellent sense of humor, one can enjoy the delights of collaborative writing without creating elaphantine sentences that few will appreciate, and fewer still will understand. AxisPortals Aphorism: A big orange moon and the cool stillness of a spring night call for smooth jazz.